True story: My mother once went on a short trip with her sister. 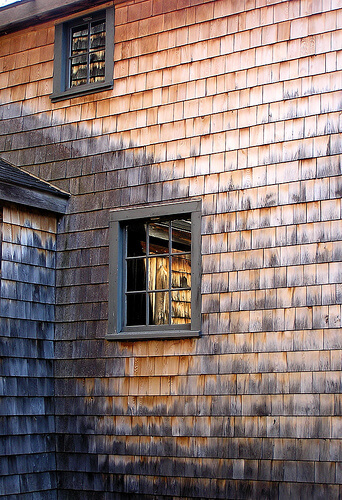 When she returned home, she discovered that my father had cedar shingled the bathroom walls. I don’t know what inspired my dad to do this. He wasn’t the type to read home decorating magazines. And, he wasn’t the sort of guy who commonly undertook home renovation projects. I picture him sitting on the couch reading the newspaper one Saturday morning and having the epiphany that, since shingles look great on the exterior of maritime houses, they’d look fantastic on the walls of our upstairs bathroom. This wasn’t an easy project for my dad, who was, like me, a member of the measure-once-cut-multiple-times school of craftsmanship. He had to saw holes in the shingles for light switches. Adding to the challenge, the small finishing nails he used wore away at the dry wall, making the shingles a bit wobbly. Upon her return home, my mother wasn’t pleased. The shingled bathroom walls were a continual irritant in their otherwise happy union for about 15 years until my father finally gave in and allowed my mother to call a contractor to renovate the bathroom. I’ve just returned from a two-week vacation and was relieved to see that no one undertook to shingle the walls of the Blatant Media games room while I was away. 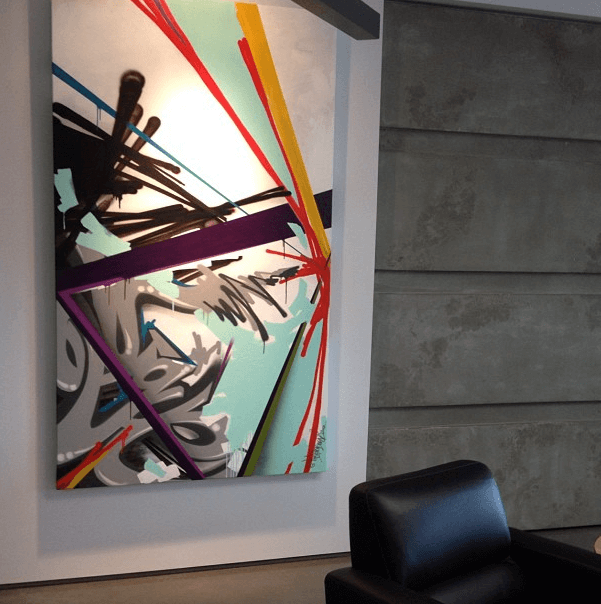 What is new, though, is the arrival in our Atlantic Avenue Art Block offices a fourth painting by David Brunning, TheKidBelo, one of Western Canada’s premier visual artists. You can see the others here and here.